However, being that his favorite past time and source of exercise (he was an avid barefoot water skier), could only be practiced on weekends during the late fall, winter, and early spring, John caved and gave running a chance, starting two days per week with his officemate. After a short time, his officemate encouraged him to try races since they were a lot of fun. After his first two competitions, he was hooked. Following his start, John improved steadily, and continued to set PRs through the spring of 2006. 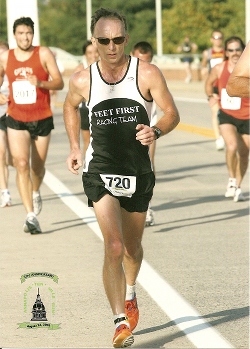 After nursing some injuries in 2007, John is back on track and hopes to set many more personal bests in the near future.